This document is part of a series of modules forming the CCIAQB Guide for Indoor Air Quality available at http://www.IAQForum.ca. For definitions and acronyms, refer to Module 1 – Introduction to Indoor Air Quality (IAQ). This document is a compilation of “safe” material that is already available out there (or as they say: “summary compilations of existing information from many sources”). It’s good to have a simple compilation like this, and hopefully soon they will feel confident enough to update the module encouraging stronger actions and better enforcement. I wish the phrase “Wherever possible” that gets used in so many policies could be banished (why wouldn’t it be possible?) and that laundry products were included in all lists of fragranced products to avoid. 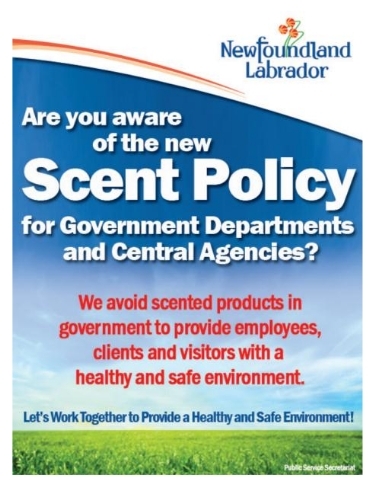 The Canadian Medical Association Journal (CMAJ) is encouraging hospital accreditation standards to include scent or fragrance free environments (see “Artificial scents have no place in our hospitals”). I’d like to see some kind of consistent IAQ monitoring and certification be developed, to ensure healthy (fragrance and other toxic chemical free) indoor air everywhere. As the evidence mounts regarding the adverse health effects of toxic chemicals and VOCs, many health professionals and researchers are now making public declarations urging people, especially women and children, to avoid fragranced products (among other toxic exposures), so implementing fragrance-free policies (and enforcement) everywhere is very clearly in the interest of public health and future generations, in addition to providing access to people with environmentally related disabilities.. Ultimately it seems that responsible business and building owners, organizations, provinces, and states will have to regulate IAQ, banning indoor fragrance chemicals like they’ve banned smoking, as it seems to be beyond the capacity of any current federal government to ban the numerous toxic chemicals that are found in so many personal care, laundry, and cleaning products, as well as other everyday products and materials. Imagine a world where we all have the right to a healthy environment, instead of the right to pollute (or be polluted). So many health problems could be prevented. Here’s to clean and healthy air everywhere! This entry was posted in Accessibility, Air Quality, Environmental Health, Environmental Sensitivities, Healthy Environment, Indoor Air Quality, Policy, Precaution and tagged allergies, asthma, cancer, Chemicals, environmental sensitivities, Fragrance, fragrance-free, hazardous air pollutants, health, Human Rights, IAQ, MCS, MCS/ES, petrochemicals, VOCs. Bookmark the permalink. Thank you for the great articles. Every time we go to a hospital or doctors office we come home sicker than when we left home. Thanks so much for tackling this huge problem. And there’s something so wrong with that! Hospitals and other health care offices especially should have excellent IAQ!